Most MOBAs tend to break just after they’ve had an update, at the hands of their players. The Heroes of the Storm dev team like to do it themselves, beforehand. 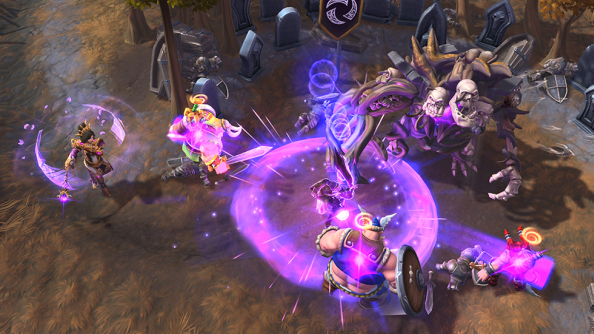 Consider Cho’gall, the two-headed ogre whose dual personality requires two players to partner up – and at the other end, the three characters controlled simultaneously as the Lost Vikings. Look at Murky, squished in an instant, useless in the wrong hands, but just as quickly returned to the field at a spawn point of his choosing. Each hero a game unto themselves, the stuff of overambitious mods. Looking to master a MOBA? Here are our picks for the best League of Legends champions. There’s this sense of gleeful abandon to all of Heroes of the Storm’s character designs – one that isn’t evident in other games of its type. So what’s in the water at HotS HQ? Game director Dustin Browder traces the trickle of inspiration back to a single design decision – the abandonment of an item shop of the kind seen in traditional MOBAs in favour of a more flexible talent system. The problem with Blizzard’s nascent item shop became suddenly apparent when the Heroes team started work on Abathur – not so much a square peg as an amorphous, pulsating bag of zerg DNA. Nothing created for him within the stricture of the shop system worked – so the team ripped it up and unfolded a new plan. Don’t forget: the core of the Heroes of the Storm team had come from StarCraft. Though the changes made to the seminal eSports RTS now are careful and conservative, the design decisions that put it there were born from an excess of ideas – its three races “almost three different games smashed together”. 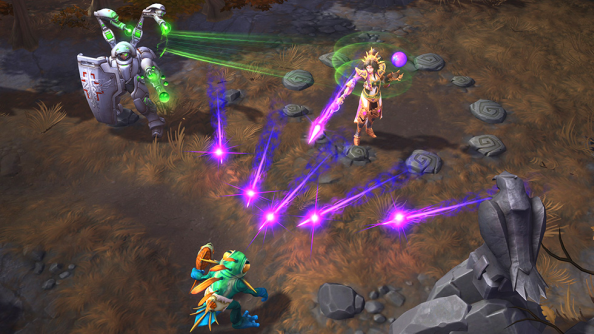 Blizzard even coined a design philosophy – “concentrate the cool” – around it. For Heroes of the Storm, Browder does his utmost to empower hero designers to build characters as different from each other as possible. That process can see failure follow failure, as with the creation of new gnomish time lord Chromie. 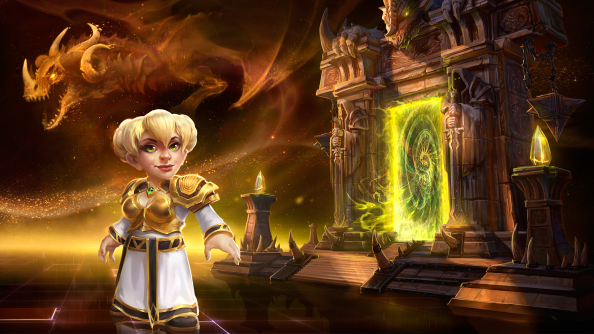 Chromie’s design team promptly fell into a pattern of testing and burning ideas, one after the other. The artillery is a Sand Blast ability – a devastating mortar strike that launches a full second after activation. Blizzard knew they wanted players to miss, to fail to predict where their targets were going to be. In that frustration lies Chromie’s magic. Upcoming hero Medivh, out June 14th, was a completely different but equally strange story. A corrupted guardian with his roots in Warcraft III, he was first envisioned as a mage who “just hulks out with power”. 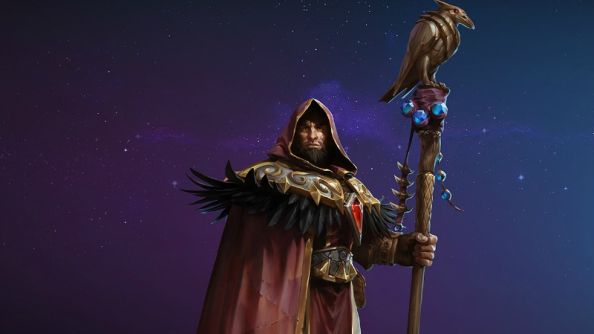 Instead, after learning the art team would tackle Medivh in his ‘mysterious prophet’ guise, the designers decided he would be a repentant old man. Beyond that, naturally, Hagman wanted a game-breaking skill. Medivh can take the form of a raven. As with all of Heroes of the Storm’s strangest creations, these celebrations of the outlandish and unprecedented, Medivh is tricky to wrap your brain around – but has the potential to be wildly potent when mastered.